“The stevedoring industry has changed significantly over time, with large increases in productivity and reductions in costs since the ACCC started monitoring the industry 20 years ago, but challenges remain,” ACCC Chair Rod Sims said. Shipping lines have been able to negotiate cheaper rates because of growing competition between stevedores and consolidation in the shipping line industry, resulting in an 8.5 per cent fall in quayside revenue per lift for stevedores. Stevedores continued to rapidly increase infrastructure charges applied to truck and rail companies delivering or collecting containers at port, which has led to strong criticism from transport operators and cargo owners. Stevedores have justified these charges with increases in operating costs and the need to invest in infrastructure to handle the increasingly large ships visiting Australian ports. It is not unreasonable for stevedores to recover some costs for investment in container terminal facilities. However, transport operators and cargo owners are limited in being able to respond to higher stevedore charges by taking their business elsewhere, unlike shipping lines. “The use of infrastructure charges means that stevedores can earn a greater proportion of their revenues in a market in which their market power is stronger relative to the more competitive market in which they provide services to shipping lines,” Mr Sims said. The ACCC does not have the power to determine stevedoring charges as they are not a regulated asset. “State governments, which regulate stevedores and ports, may need to conduct further detailed examination and, if warranted, use their regulatory powers,” Mr Sims said. 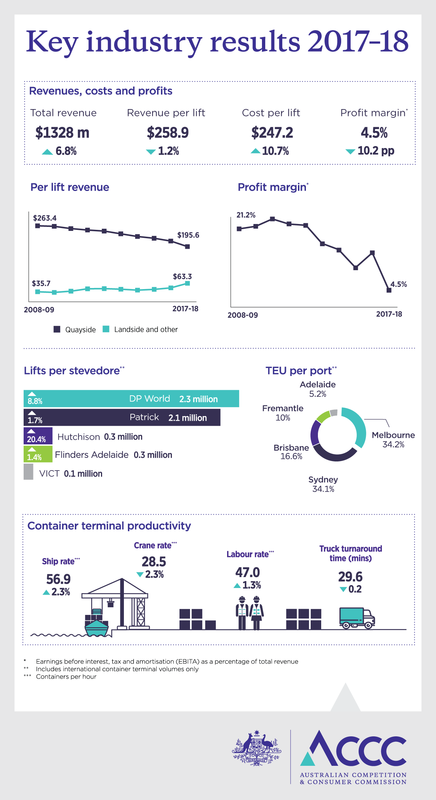 Two stevedores, DP World and Flinders Adelaide, commenced extensive capital expenditure in 2017–18, with very little investment from other stevedores. In 2017–18, productivity performance remained mixed; while labour and multifactor productivity improved slightly, capital productivity fell slightly. Truck turnaround times continued to improve in Melbourne, but deteriorated slightly in Sydney. The ACCC has monitored the container stevedoring industry since 1998-99 under a direction from the Australian Government. Container stevedoring involves lifting containers on and off ships. The ACCC currently monitors the prices, costs and profits of container stevedores at five Australian container ports. Patrick and DP World operate at the four largest ports—Brisbane, Fremantle, Melbourne and Sydney. Hutchison operates in Brisbane and Sydney, while VICT commenced operations in Melbourne in early 2017. Flinders Adelaide is the sole terminal operator at the Port of Adelaide.